Kellogg student Tammy Hsu is on her seventh session of white light therapy and feels the benefits already. The program was added to Henry Crown Sports Pavilion in October 2018 and aligns with NU Recreation’s goal of addressing the mental health concerns of the NU community. There’s no doubt that Midwest winters are brutal, said Nancy Tierney, Northwestern Recreation’s associate director of fitness and wellness. The lack of sunshine and prolonged periods of subzero temperatures are saddening. With this in mind, she and her team at the Wellness Suite in Henry Crown Sports Pavilion seek to offer services that make the winter a bit more bearable. Tierney said white light therapy, the Wellness Suite’s newest program, is the best one yet. On an flier Tierney made for clients, she explains that white light therapy is exposure to full-spectrum light through light boxes. The light emitted is similar in composition to sunlight. When it enters through the eyes indirectly, the light is thought to stimulate the production of brain chemicals. Doctors have recommended the therapy to patients suffering from seasonal affective disorder, sleep and mood disorders, and low energy levels, too, Tierney said. Tierney said the key to feeling the effects of white light therapy is repeated exposure as well as gradually increasing the amount of time exposed to the light. She recommends users come three to four times a week for maximum benefits. Tierney also suggests users enjoy white light therapy before 3pm, as exposure to the light after this time may interfere with sleep. Tierney said the program has been at the Crown Sports Pavilion since October 2018. She said she and her colleague Dan Bulfin, director of recreational sports, were inspired to offer white light therapy after seeing it at Purdue University. After researching programs at different universities, Tierney concluded that the benefits of white light therapy aligned with NU Recreation’s goal of addressing the mental health concerns of the NU community. Bulfin said in an email that since white light therapy has been offered in the Wellness Suite, it has “helped over 80 folks combat depression that often occurs due to lack of exposure to regular sunshine” in the colder months. Lisa Carlson, NU’s campus dietitian, said the addition of white light therapy can compliment students’ healthy lifestyles. White light therapy is “accessible to everyone,” Tierney said, and free for NU students, faculty and staff, and paying Crown Sports Pavilion members. Students can make an in-person or over-the-phone appointment as well as drop by the Wellness Suite for a walk-in session. “We never turn anyone away,” Tierney said. 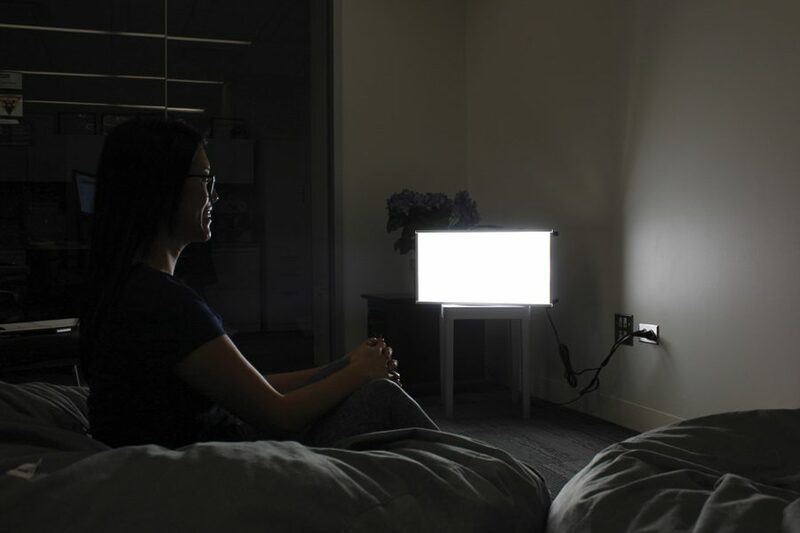 Kellogg graduate student Tammy Hsu said she started white light therapy because she was experiencing what felt like “never-ending jet lag” after returning from a trip. Her doctor recommended she try it, and she is now on her seventh session. Since it premiered Fall Quarter, Tierney said over 300 white light therapy sessions have been completed. She noted that the Wellness Suite now has “white light therapy regulars,” and most of them are students. The Wellness Suite plans to continue offering white light therapy through April and will resume the service again during fall 2019.